In the EIA report the transit of the LNG Carrier via the west of Lantau was not considered as a viable alternative due to water depth constraints. The following text appears in Part 3, Section 13, Sub-section 3 Page 6. 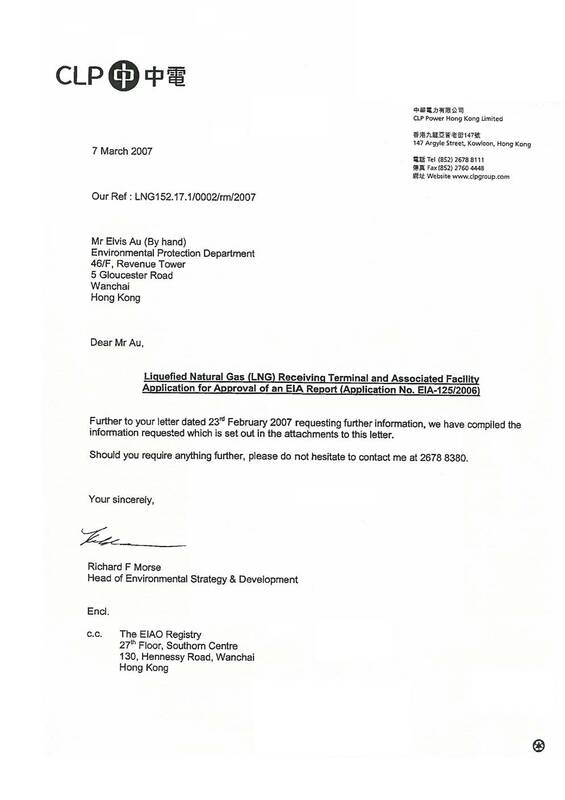 CAPCO understand that the Tonggu Channel Project was proposed 14 May 2003 () and an EIA for the section of the route in Hong Kong waters was rejected by EPD on 24 March 2005 (). The previously proposed alignment is shown in red on Figure 1 below. The details of the project as it stood in the Project Profile for the EIA were as shown in Table 1 below. CAPCO understands that a new alignment has been proposed by the Tonggu Channel Project Proponent which is now entirely in Mainland waters, as shown on Figure 2 below () . CAPCO understands that this new alignment is a unidirectional channel with a width of 210m and a depth of -15.8m PD. The majority of the 20 km route falls within the core area of the Pearl River Estuary Chinese White Dolphin Nature Reserve. Under the regulations for this Nature Reserve any “destructive activities” are prohibited in this area’. The Reserve is governed by a Protected Area Management Board. The initial dredging volume is around 50 Mm3 with a recurrent annual maintenance dredging volume of 2.6 Mm3 per year. As stated above the channel is at present unidirectional with a width of 210m. Although the depth of the channel is sufficient, additional dredging would be required to increase the width of the channel so that it meets with the PIANC guideline of a minimum width of 250m. Also the PIANC guidelines indicate that for safety reasons a 400m bidirectional channel is preferred. The additional dredging associated with widening the channel to 250m would be approximately 10 Mm3. There would also be the need to conduct incremental annual maintenance dredging of 0.5 Mm3 per year for the lifetime of the LNG terminal. Given the presence of the Pearl River Estuary Chinese White Dolphin Nature Reserve, CAPCO would have concerns regarding the incremental impacts that this dredging work would pose. If the Black Point option incorporated the Tonggu Waterway then the total initial dredging volume of this option would increase to 13.15 Mm3 which is extremely high when compared to the South Soko option which has a total of 3.89 Mm3. 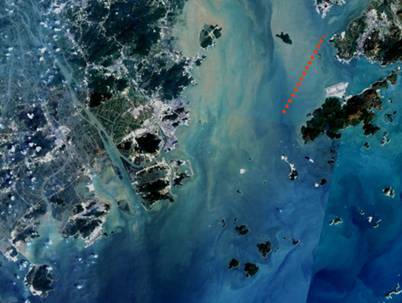 In conclusion, while a carefully managed and short term marine construction program can be compatible within a potential marine reservation area, such as the waters of Southwestern Lantau, the incremental dredging associated with incorporating the Tonggu Waterway into the Black Point option makes it less favourable for environmental reasons when compared to the South Soko option due to the environmental impacts associated with significantly greater and more frequent dredging requirements. The Landscape Impacts on South Soko are examined in two sections of the report. 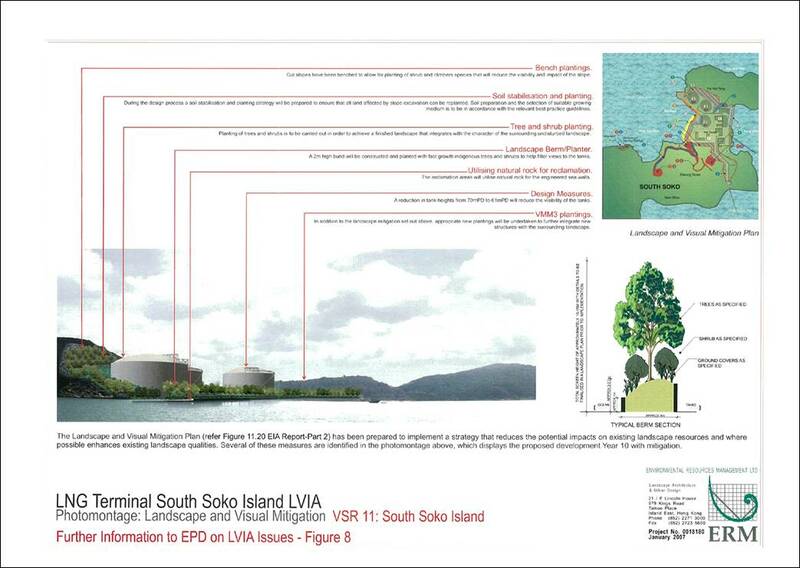 Part 2, Section 11.10 (page 28) summarises the un-mitigated landscape impacts that the LNG Terminal would have on the Landscape Resources (LRs) of South Soko Island. Significant impacts are expected on two LRs, Moderate/Significant Impacts on 1 LR, Moderate impacts on 5 LRs, Slight/Moderate Impacts on 1 LR and Negligible impacts on 2 LRs. Mitigation measures are proposed in Section 11.11 (pages 29-31) and are illustrated in Figure 11.20. The resulting residual impacts on the 12 Landscape Resources after year 10 of mitigation measures are not expected to result in any Significant or Moderate/Significant impacts on any of the LRs. There will be moderate impacts on the Plantation, Rocky Shoreline and Sandy Beach areas. There will be Slight impacts on the Shrubland, Grassland and Abandoned Wet and Dry Agricultural land. The remaining 6 LRs will have Negligible residual impacts. The un-mitigated impacts on the Landscape Character Areas (LCAs) are analysed in Section 11.18, (pages 91-92). There will be a Significant impact on the Islands Landscape, Moderate/Significant impacts on the Inshore Waters landscape, a Moderate impact on the Offshore Waters Landscape, and a Slight/Moderate impact on the Abandoned Institutional Landscape. Mitigation measures are proposed in Section 11.19 (pages 93-94) and are illustrated in Figure 11.20. 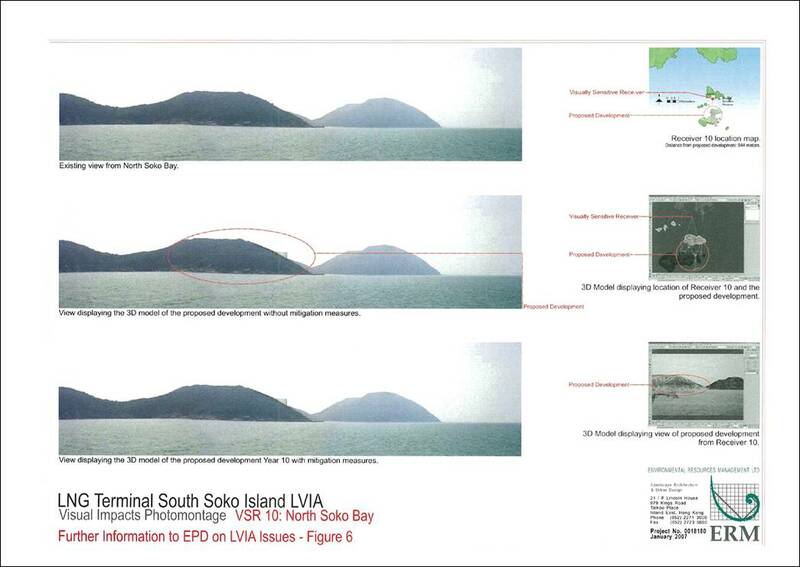 In addition to these mitigation measures, Section 11.19.1 details avoidance measures that also reduce the impact on the LCAs including the reduction of the extent of the reclamation, the clustering of the tanks closer together, the positioning of the tanks behind the hill at the northern end of South Soko and an overall reduction in the total area of the terminal. As a result of these mitigations measures, all of the impacts on the LCAs will reduce in one order of significance threshold. There will therefore be a Moderate/Significant impact on the Islands Landscape, a Moderate impact on the Inshore Waters landscape, a Slight/Moderate impact on the Offshore Waters Landscape, and a Slight impact on the Abandoned Institutional Landscape. 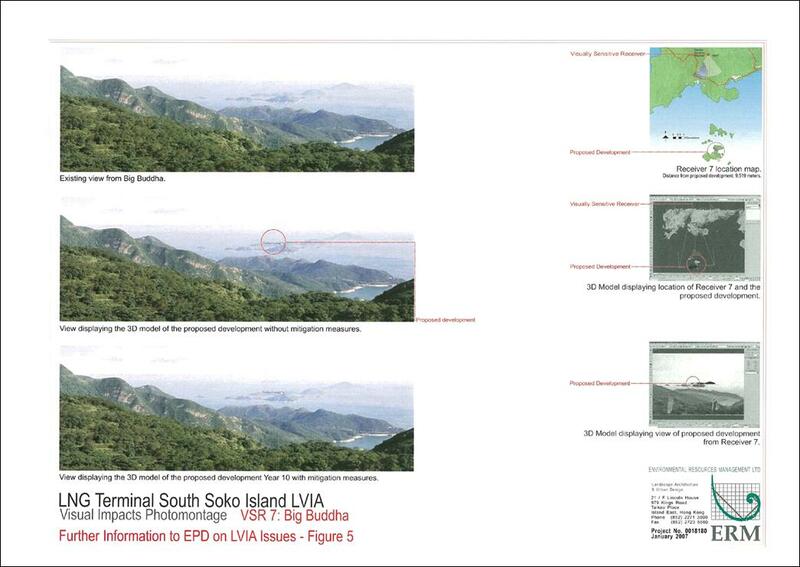 The visual impacts arising from the development are described in Section 11.13.11 (Pages 48-78). Visual Mitigation Measures are proposed in Section 11.14 (page 79). The LNG Terminal has been carefully designed to minimize its potential visual impacts. In particular the LNG tanks which are the largest and most visible element, have been located at the base of the hill at the northern end of the island to minimize their visibility. Of the 15 Visually Sensitive Receivers (VSRs) analysed in the study, only marine visitors off South Soko Island will experience a Significant impact with visitors to North Soko Island experiencing a Moderate/Significant impact. Both of these VSRs are located in close proximity to the LNG Terminal and experience low visitor numbers. Due to the large distance between the LNG Terminal and Lantau Island, the visual impacts to VSRs located on South-West Lantau will be lower. The only VSR group to experience even a Moderate impact are those located at Tai Long Wan Tsuen. The Macau Ferry users and walkers on the Fan Lau peninsula will experience Slight-Moderate impacts. Visitors to the Big Buddha along with those in Shek Mun Sha, Cheung Sha Beach Lower and Sunset Peak will only experience a Slight impact. All of the remaining 6 VSRs will experience a Negligible impact. According to the Technical Memorandum on the Environmental Impact Assessment Process (EIAO-TM) the Landscape and Visual Impacts are considered acceptable with mitigation. The impacts of underwater noise on marine mammals have been discussed at length in the EIA report. Sections of relevance are 9.7.1 page 43 and pages 47-50. The conclusion was that with specific mitigation measures (Section 9.9.2) and additional (precautionary) measures in place (Section 9.10) adverse residual impacts from underwater sound generation are not expected to occur. Underwater sound at the intake head will be minimal as water will flow through the intake by means of gravity. The only sound generated through extraction of seawater will be from the pumphouse, which will be located on existing land within the LNG terminal footprint. On this basis, disturbance to marine ecology, such as cetaceans, through underwater sound generated by the seawater intake and outfall system is not expected to occur. It is is also considered important to note that the findings of a two year marine mammal survey, the results of which are presented in the Annexes to Section 9, indicate that very few sightings of marine mammals have been made in the direct vicinity of either the intake or outfall systems. Regarding the potential impacts to fish eggs and juvenile fish as a result of seawater extraction for the operation of the LNG terminal at South Soko, the findings of the assessment have concluded that impacts are not expected to be significant. The seawater intake head is to be located in an area which has a typical abundance of fisheries resources, i.e. it has similar characteristics to extensive areas of the southern waters of Hong Kong. In addition, the maximum volume of water proposed to be extracted for the operation of the seawater intake is approximately 18,000m3 hr-1, which is similar in scale to the volume extracted by other cooling water intakes in Hong Kong. For example the Central Reclamation Phase 3 waterfront system will extract an average of 20,137.5 m3 hr-1. The LNG terminal volume of extracted water is relatively low when compared to the average hourly volume of 323,280 m3 hr-1 (wet season) currently extracted as part of the operation of the existing Hong Kong Electric Power Station on Lamma Island. This facility is located within the same fisheries spawning ground and nursery area as the South Soko terminal (). The impact assessment has acknowledged the presence of species such as the crustacean Oratosquilla and fish from the family Sciaenidae (Part 2, Section 10.3.2 Page 9 and 10) in the nursery area and impacts to commercial fish and crustacean resources in this nursery area have been assessed (Part 2, Section 10.5.1 and 10.5.2). The cooling water system has been described in the EIA and consists of an intake supply which will draw seawater into the Open Rack Vaporiser system (ORV). Within the ORV the seawater will warm up the LNG and in so doing become cooled. When the seawater is discharged from the ORVs it then gravity flows through an open culvert to the discharge point underneath the LNG jetty. As seawater flows through the culvert its temperature can be expected to increase, although no account for this has been taken in the assessment. Chlorine is added to the water as it enters the seawater intake system in order to keep the ORV free of biofouling organisms. Once added to the seawater system, chlorine is diluted and a residual concentration of chlorine remains within the discharged water. This is termed Total Residual Chlorine, or TRC. In countries such as Japan, ORV systems typically operate with a TRC concentration of 0.5 ppm within the discharged waters. In Hong Kong, the discharge standard under the Water Pollution Control Ordinance (WPCO) Technical Memorandum is currently 1 ppm. For the LNG terminal, CAPCO has agreed to discharge a maximum TRC concentration of 0.3ppm. Although a conservative approach has been adopted (i.e. a continuous discharge at the maximum concentration), potential impacts to marine life through such a discharge have been modelled to assess environmental acceptability. The results of this modelling and the impact assessment of effluent containing TRC and reduced temperature have been addressed in both the Marine Ecology (Section 9) and Fisheries (Section 10) Impact Assessments in Part 2 of the EIA Report. The Water Quality Impact Assessment, in which the results of the modelling used to predict the pattern of dilution and dispersion of temperature and TRC in marine waters at South Soko is discussed in Part 2 Section 6 of the EIA Report. The results of the modelling exercise were compared and evaluated against applicable standards (i.e. the Water Quality Objectives (WQOs) as well as relevant internationally applicable criterion for marine ecological and fisheries assessments). The criteria adopted have been taken from Environmental Impact Assessments (EIA) previously approved under the Environmental Impact Assessment Ordinance (EIAO) in the Hong Kong SAR and international guidelines. No exceedance of any of these criteria have been predicted to occur at identified sensitive receivers as a result of either the construction or operation of the LNG terminal and associated facilities at either the South Soko or Black Point sites. In terms of the potential impacts through discharge of cooled water, it is also considered important to note that the ambient temperature of the waters surrounding South Soko Island ranges significantly throughout the year due to Hong Kong’s subtropical conditions. Data from the EPD recorded between 1996 and 2006 indicate that the minimum temperature of these waters has been recorded at 15.4°C; whereas the maximum is 29.8°C (Section 6 Table 6.4). Marine organisms that utilise these waters may therefore be expected to be acclimatised to such thermal change. As such, a comparatively small difference of 2°C below ambient, which the discharged waters assimilate to within 200m of the discharge point, would not be expected to result in significant impacts to marine ecology or fisheries resources. Furthermore, the maximum temperature difference at the closest sensitive receiver (False Pillow Coral on South Soko Island) has been predicted to be less than 1°C below ambient, which, on the basis of the range of natural fluctuations in water temperature discussed above, would not be expected to result in adverse impacts to these sensitive receivers. The relevant sections of the EIA that explain the impact to fish eggs and juvenile fish as a result of the intake and outfall system have been extracted and are presented in Attachments 1A & 1B. Issues concerning impacts from underwater sound are presented above in Item (iv). Given that unacceptable impacts to marine ecological and fisheries resources (ie the prey items of marine mammals) are not predicted to occur (as discussed above in Item (v), unacceptable impacts to marine mammals from the cooling water discharge are not predicted. Extracted from Part 2 - South Soko - Section 3.3.3 - Page 17. "In order to provide water for regasification of LNG, seawater will be extracted from Tung Wan via submarine intake. The intake will extend approximately 300 m from the pumphouse to the offshore intake heads (Figures 3.9 and 3.10). It is proposed that a typical box culvert design be employed and the intake structure comprises of a precast concrete tower ballasted with mass concrete. The tower would be connected to the seawater pumphouse by submarine pipelines. The foundation will likely comprise a rockfill base placed directly over the rockhead level following dredging by grab dredgers to remove a thin layer of marine deposits beneath. The intake from the tower would be placed at an approximate depth of approximately –3 mPD. A cross-sectional drawing of the conceptual intake is presented in Figure 3.10." Cooled water with a temperature of approximately 12.5°C below ambient will be discharged at the seawater outfall, which is located close to the seabed in the vicinity of the LNG carrier jetty. There are no water quality sensitive receivers in the immediate vicinity of the proposed discharge point. The maximum flow rate of the discharge is expected to be equivalent to 18,000 m3 hr-1. Compliance with the WQO (D ± 2 °C from ambient) must be achieved at sensitive receivers. The discharge of cooled water has been simulated using computational modelling. The results from the cooled water discharge modelling are included in Annex 6G and have been presented as contour plots showing impacts of cooled water discharges in the vicinity of the outfall. Figures SK_G01-G02 show the differences of the maximum temperature reduction between the maximum operational discharges and the baseline, representing the most conservative case. It can be seen from the contour plots that the extent of temperature change from ambient for both the wet and dry seasons is predicted to be confined to the bottom layer, with no impact to the surface layer of the water column and no impact at sensitive receivers. This may be expected as the discharge of cooled water is close to the bottom and the relatively higher density of the cooled water results in weak vertical mixing. Due to the distance to sensitive receivers, no non-compliance with the WQO has been predicted in either the dry or wet seasons. For the most conservative case (maximum operational discharge, see Figures SK_G01 and SK_G02), the temperature change is predicted to be less than 2 °C in both the dry and wet seasons. The temperature change of 2 °C will be confined to < 200 m from the outfall in the dry season and the wet season. The model results indicate that the dispersion of cooled water is rapid and not expected to cause an unacceptable impact. Cooled water with a decreased temperature of approximately -12.5°C from ambient will be discharged at the seawater outfall, which is located at the sea bed on the south coast of South Soko Island. The flow rate of the discharge is equivalent to 18,000 m3 hr-1 (peak flow). The discharge will be compliant with the WQO (Part 2 Section 6). The potential impacts of this discharge are principally related to the ecological effects in a zone of reduced temperature near the point of discharge. Impacts will be limited to a relatively small area in the bottom layer of the water column (Part 2 Section 6). The results from the cooled water discharge modelling obtained for both the wet and dry seasons have shown that the temperature change is predicted to be confined to the bottom layer with little or no impact to the surface layer. As such impacts within the intertidal zone will not be expected as there is little or no impact to the surface layer of the water column (intertidal zone). In deeper water or the subtidal zone, impacts to the benthos are expected to be minor as the extent of the affected area is small. Induced temperature changes to natural aquatic habitats have been proven to have detrimental effects on the physiology of fishes. The decline in temperature has the potential to alter the rate of development of fish embryos, larvae and gonad maturation. A slower growth rate means that fish larvae remain longer in the delicate early development stages, potentially increasing mortality () . The altered development of gonad maturation could ultimately reduce the spawning success of fish species and the altered mechanism of muscle development () could potentially reduce the chance of survival of juvenile fish. Cooled water with a temperature of approximately 12.5°C below ambient will be discharged from the LNG terminal’s seawater outfall located near the bed layer of the water column. The results of the water quality modelling in Part 2 Section 6 have predicted that a temperature change exceeding the WQO of +/-2°C will remain in the bed layer within approximately 200m of the outfall in the dry season and approximately 70m in the wet season. The results presented in Part 2 Section 6 indicate that the impacts to seawater temperature caused by the open circuit process are predicted to be localised. Furthermore, from a review of the results of the Ichthyoplankton and Fish Post-Larvae Survey presented in Annex 10 it emerges that the sensitivity of the fisheries resources in the proximity of the proposed LNG terminal is medium-low due to the comparatively low density of fish larvae and post larvae recorded, thus further reducing any potential adverse effects of the localised temperature change. It is therefore expected that the cooler water discharge will not cause unacceptable impacts to the fisheries resources. Residual chlorine in the marine environment can be harmful to marine organisms only if concentrations exceed tolerance levels. It has been found that harmful effects begin to occur at concentrations above 0.02 mg L-1 in water (). The discharge limit for residual chlorine is 1.0 mg L-1 according to EPD’s Technical Memorandum for Effluents issued under Section 21 Water Pollution Control Ordinance, Cap 358. There is no value specified in the WQOs for the Southern WCZ, nor for any other WCZ. The criterion value of 0.01 mg L-1 (daily maximum) at the edge of the mixing zone has been chosen as the criterion against which to assess the results from the computer modelling of chlorine dispersion, which is also the criterion adopted in the approved EIA Report for the 1,800 MW Gas-fired Power Station at Lamma Extension (). The water quality impacts due to chlorine discharges have been assessed using computational modelling (see Water Quality Method Statement in Annex 6A). The results from the chlorine simulations are presented as contour plots of mean and depth averaged chlorine concentrations for the spring and neap tidal periods in the wet and dry seasons. The contour plots are provided in Annex 6H. Figures SK_H01-08 present the maximum operational discharges, while Figures SK-H09-16 show the fluctuating operational discharges. Both discharge rates appear to result in a similar pattern of residual chlorine dispersion. The dispersion results obtained for both the wet and dry seasons have shown that the majority of the residual chlorine is contained within the bottom layer, with little or no chlorine in the middle and the surface layers. This indicates that the release of the chlorine near to the seabed and the relatively higher density of the cooled water, in which the chlorine is discharged, results in weak vertical mixing. The model used the assumption that the terminal would discharge total residual chlorine at a maximum concentration of 0.3 mg L-1. This concentration is similar to that for most power stations in Hong Kong and is below the EPD’s limit of 1.0 mg L-1. Based on the predictions, the maximum extent of the > 0.01 mg L-1 contour is <300 m from the discharge point during the dry season and <100 m during the wet season (Figure SK_H01 and Figure SK_H05). These areas were defined as the “mixing zones”. Due to the small extent of the plumes, and the fact that no sensitive receivers would be affected, no unacceptable water quality impacts from residual chlorine discharge are expected to occur. The short duration peaks of residual chlorine discharge will also not contribute to any unacceptable adverse impacts. The assessment confirms the environmental suitability of the proposed discharge. There are considerable operational and ecological issues caused by organisms within, and passing through industrial water systems and, these problems can be costly (). Mussels, oysters and other marine organisms growing within cooled water circuits have resulted in losses in thermal efficiency and even total shutdowns. To counteract settling and actively growing fouling organisms, cooled water circuits are usually dosed with antifoulants (typically chlorine in the form of sodium hypochlorite). The discharge of the resulting (chlorinated) effluents may in turn have effects on the habitat beyond the outfall. The effluent from the cooled water system will contain traces of antifoulant at a concentration of approximately 0.3 mg L-1, which is below the EPD’s () statutory limit of 1.0 mg L-1. Values for observed toxic effects of chlorine are available from the literature and can be used for reference purposes (Table 9.6). For the majority of organisms the toxicity of residual free chlorine depends on the concentration and exposure time. Short exposure to high concentrations often leads to lethal effects as do long term exposures to low concentrations (). Short term exposure has led to rapid but temporary responses demonstrated through depression in metabolic rate and reproductive activity. Tolerant of short term exposure with no demonstrated toxic response. Respiration rate increased after 60 minute exposure to 0.1 mg L-1 and after 30 minute exposure to 0.1 mg L-1. Concentrations of residual chlorine typically diminish rapidly with time and distance from the discharge point (). The modelling exercises conducted for the water quality assessment (reported in Part 2 Section 6) indicate that residual chlorine concentrations exceeding 0.01 mg L-1 are only likely to occur within 300m of the outfall and are mainly confined to the bed layer of the water column. These predicted increases do not exceed tolerance thresholds established in the literature (0.02 mg L-1) and are in accordance with those levels recommended in previous studies in Hong Kong (0.01 mg L-1). As a result, impacts to marine ecology as a result of potential concentrations of residual chlorine are not expected to occur. There are potential operational issues caused by the growth or encrustation of marine organisms on the open loop vaporization system (i.e., pipes, valves etc.). Operationally, the colonization of marine organisms such as algae, bryozoans, molluscs and cirripedes within cooled water circuits could result in losses in thermal efficiency and reduced reliability of the system (including total shutdown). To counteract settling and growth of marine organisms, cooled water circuits are typically dosed with chemicals (usually sodium hypochlorite). Such chemicals are known as antifoulants and they inhibit the growth of organisms within the circuit by creating unsuitable living conditions. A secondary consequence of this form of treatment is associated with the discharge of the treated seawater into the marine environment. Research has been conducted internationally on the effects of chlorine discharges on marine ecological and fisheries resources. The international review provides data which can be used as a benchmark to evaluate potential impacts. Work on the toxic effects of chlorine on fish eggs and larvae has indicated that abnormal development may occur at concentrations of 0.31 to 0.38 mg L-1 (). However, behavioural studies have indicated that adult fish will avoid areas where concentrations of free residual chlorine in the water exceed 0.035 mg L-1 (). The proposed LNG terminal is predicted to discharge residual free chlorine at a concentration of < 0.30 mg L-1. This concentration is below EPD’s discharge limit of 1.0 mg L-1 (). Concentrations of residual chlorine have been shown to diminish rapidly with time and distance from the discharge point (). A concentration of residual chlorine of 0.01 mg L-1 (daily maximum) at the edge of the mixing zone is the criterion used in the Water Quality Assessment (Part 2 Section 6). The modelling exercise conducted in the assessment indicates that maximum residual chlorine concentrations exceeding 0.01 mg L-1 are only likely to occur within 300 m of the outfall and are mainly confined to lower layers of the water column. These predicted increases do not exceed tolerance thresholds established in the literature (0.02 mg L-1) and are consistent with levels recommended in previous studies in Hong Kong (0.01 mg L-1). Consequentially, significant impacts to fisheries resources as a result of the discharge of chlorinated water are not expected to occur. The discharge and intake points for the seawater to be used in the proposed open circuit system will be separated to reduce the re-circulation of the cooled water and therefore maximise the efficiency of the heat exchange process. In order to draw in the warmest water to the vaporisers for optimum efficiency in the regasification process, the seawater intake will be designed to be as high as possible within the water column. The intake structure is made up of a concrete tower ballasted with mass concrete connected to the onshore seawater pump house by a submarine pipeline. The intake will be appropriately screened to reduce the uptake of marine organisms and suspended material. From a fisheries perspective the high volume and velocity of inflowing seawater may have negative effects on fish, fish eggs and crustaceans due to the physical damage caused by collisions with the screen (impingement) and due to their uptake and exposure to the vaporization process (entrainment). The swimming speeds of juvenile and larval fishes vary greatly but are generally slower than the water velocity of the intake pipe. Owing to their larger size juvenile fish are generally more susceptible to impingement, whilst fish and crustacean larvae and eggs, zooplankton and phytoplankton are more exposed to entrainment, as their small size enables them to pass through the screen ()(). Whilst it is acknowledged that the uptake of seawater for the open circuit vaporization process may minimally increase the natural mortality rate of fish larvae, crustaceans and fish eggs due to impingement and entrainment, it has to be noted that the significance of such impacts is strongly dependent on the ecological sensitivity and the productivity of the impacted area. · There is no significant difference in fish density and eggs density between the identified sensitive spawning/nursing grounds of southern Hong Kong waters and the non spawning/nursing grounds of western Lantau. Based on these results, it is estimated that the sensitivity of the spawning area in correspondence of the five sampling locations (including the sampling station at the future intake position – SK1) is medium-low and it is predicted that no unacceptable adverse impacts to the fisheries resources caused by impingement and entrainment will occur. · The waters around the Soko Islands and Southwest Lantau have been previously identified as having the potential to be zoned for the purposes of marine conservation in the form of Marine Parks. · Concerns have been raised by academics and NGOs in Hong Kong about the practicalities of enforcement of Marine Parks Regulations in remote and isolated areas of Hong Kong. · The LNG terminal will require a 24 hour manned state of the art security system on the Island. · The Island of South Soko has undergone significant change from a rural situation in the 1960s through to widespread development as part of the construction works for the Vietnamese Detention Centre. The centre was decommissioned in the late 1990s and although all major facilities were demolished the Island has since been left abandoned. As a result many of the paths, retaining walls and slopes pose a safety risk to users of the Island. 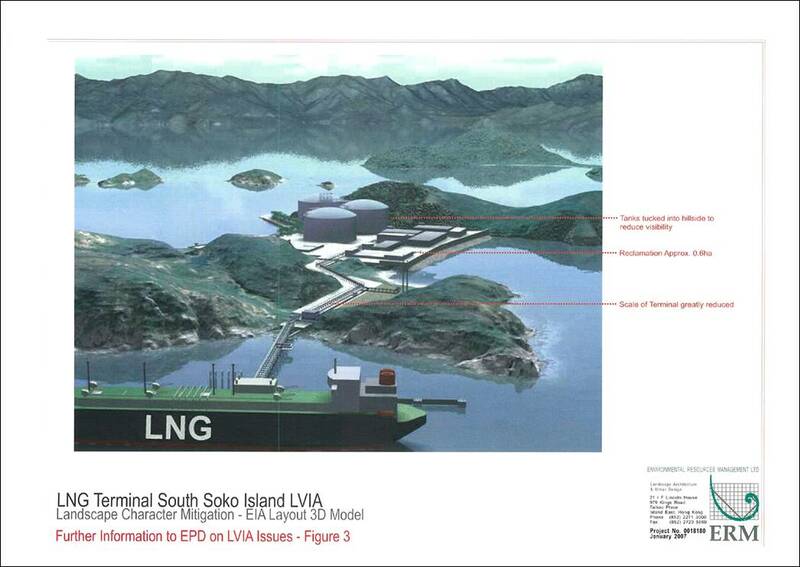 CAPCO sees no reason why the siting and operation of the LNG terminal on South Soko Island cannot go hand in hand with the designation of a Marine Park. Precedent for successful co-siting industrial facilities and conservation areas is provided locally at the Lung Kwu Chau Sha Chau Marine Park. Internationally, the Dominion Cove Point LNG terminal on the shores of Chesapeake Bay in Maryland USA provides a working example where the facility is located within a National Heritage Trust conservation area. · The security and surveillance measures in place at the terminal can be used to alert the AFCD and Marine Department concerning vessels that are violating the regulations of the Marine Park, such as anchoring, vessel speeds, banned fishing practices. Given that enforcement in outlying remote areas is acknowledged to be highly resource intensive, it is viewed that the security operations associated with the LNG terminal can be seen as a benefit to help the government to protect the Marine Park. · The abandoned state of the Island signifies that its recreational potential has not been optimised. The siting of the LNG terminal will bring to the Island the recreational, educational and public access components of the Enhancement Plan that are discussed below. It is unclear what the status of the Island would be without the LNG terminal in place with reference to improvements to paths, slopes and retaining walls. · Scientific information on the marine environment has been gathered for the purposes of the EIA. CAPCO has, however, identified a variety of studies that would be conducted should the LNG terminal be located on South Soko Island. The information gathered by these studies will provide significant contributions to the existing body of knowledge on Hong Kong’s marine environment. CAPCO is committed to working with the Country Marine Parks Authority, relevant Government departments and other stakeholders to formulate and then agree, after the EIA process has been completed, the most appropriate path forward for of implementation of an Enhancement Plan for South Soko Island and Southwest Lantau. It is intended that the Enhancement Plan would be a living document that would be updated and developed during the various phases of the LNG terminal project including pre-construction, construction and operation. It is useful to note that a comprehensive Environmental Monitoring and Audit (EM&A) programme for the LNG terminal and associated facilities has been proposed in the EM&A Manual. This covers actions required to monitor and check on impacts, largely from the construction works, to specific receptors such as water quality sensitive receivers. The Enhancement Plan does not form part of the EM&A programme. Whilst, the EM&A process will monitor potential impacts through construction and operation activities and verify the commitments made in the Environmental Impact Assessment (EIA) Report, the Enhancement Plan will provide measures to compliment the EM&A process and provide direct benefit to various sectors of the community. It is CAPCO’s intention to successfully launch the Enhancement Plan in consultation with all stakeholders. Consequently, in order to formalise the process and provide a platform for dialogue CAPCO will establish a Scientific and Educational Advisory Committee (SEAC). It is envisaged that the SEAC will be composed of a diverse membership including CAPCO, Government, NGOs, Fishermen’s representatives, Academics and representatives of relevant community bodies. The remit of the committee will largely be to advise on the implementation of the ocean and Island based components of the Enhancement Plan. The terms of reference for the SEAC will be prepared to avoid any potential overlap with those of the Country and Marine Parks Authority. The membership of the SEAC will be developed prior to commencement of construction works. 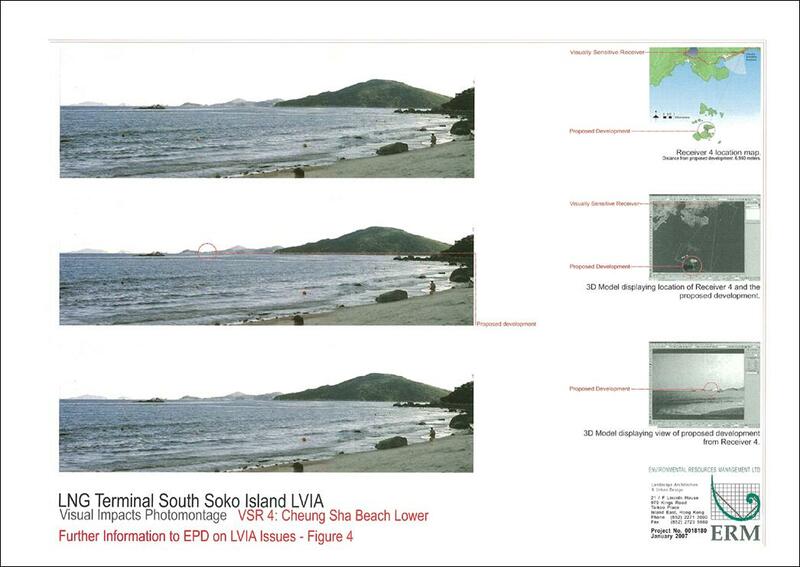 CAPCO understands that the waters around the Soko Islands and Southwest Lantau have been previously identified as having the potential to be zoned for the purposes of marine conservation in the form of Marine Parks. Whilst key findings of the EIA Report indicate that the waters around the Soko Islands have similar characteristics to the extensive southern waters of Hong Kong, CAPCO encourages marine conservation and environmental education in Hong Kong. 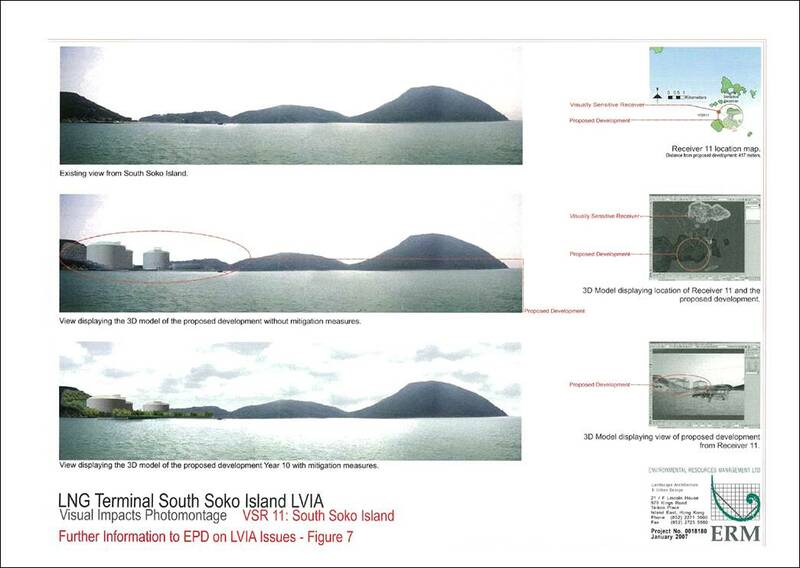 As discussed in the EIA Report CAPCO strongly believes the siting and operation of the LNG terminal on South Soko Island is possible within an area to be designated as a Marine Park. Precedent for successful co-siting industrial facilities and conservation areas is provided locally at the Lung Kwu Chau Sha Chau Marine Park. Internationally, the Dominion Cove Point LNG terminal on the shores of Chesapeake Bay in Maryland USA provides a working example where, with appropriate measures, an LNG facility is successfully located within a National Heritage Trust conservation area. The proposed co-siting provides for mutually beneficial outcomes. In order for a Marine Park to be successful enforcement of Regulations specified in the Marine Parks Ordinance (MPO) is key, particularly with regard to destructive practices (eg prohibited fishing methods) or compliance with vessel speed restrictions (a key issue with marine mammals). CAPCO appreciates that within the public community the prevention of such practices occurring has, at times, been seen to be limited with improvements sought, particularly from recreational users of these habitats (). However, it should also be acknowledged that enforcement in remote areas in Hong Kong, such as the South Soko Islands, is challenging and often requires intensive Government resources. 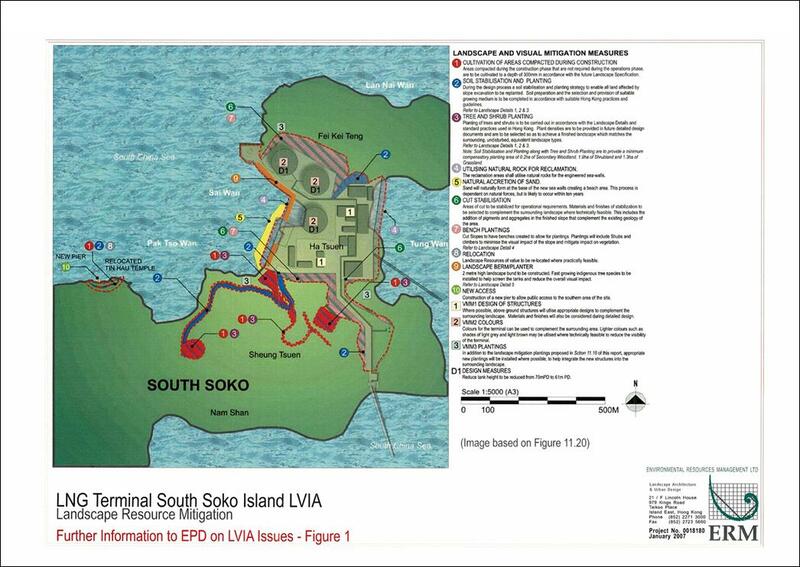 The physical presence of the LNG terminal on South Soko Island including its associated security operations can be seen as a benefit to support the Government’s protection of the Marine Park in an otherwise unoccupied area. Information gathered from the Dominion Cove Point LNG terminal has indicated that the enforcement of vessel restrictions may directly benefit commercial and recreational fisheries. Such features are discussed in more detail in Section 3. CAPCO is prepared, as a stakeholder, to assist government by funding elements of the Marine Parks programme and establishing a Marine Ecology & Natural Heritage Resource area at a location to be agreed to present the findings of surveys and monitoring works conducted during construction and operation of the LNG terminal. CAPCO envisages supporting the Country and the Marine Parks Authority to consider and decide on the optimal size of, and the objective for, the marine conservation area. · Line transect surveys of dolphins and finless porpoise throughout southwestern waters to add to the long term body of knowledge on cetaceans in Hong Kong, particularly concerning population status. · Assessment for the potential for acoustic studies surveys as part of population and behavioural investigations of dolphins and finless porpoise throughout western waters in Hong Kong. · Subtidal dive surveys of coral reef habitats (particularly of the False Pillow Coral) and associated reef fish along the coastlines of the Soko Islands before and during dredging and during the operation of the LNG terminal as agreed with the SEAC. · Fish fry and larvae surveys throughout the southern waters of Hong Kong, including in and around the waters of the proposed Marine Parks and southern waters spawning and nursery grounds. · Fisheries monitoring and analysis with particular reference to the catch per unit effort within the proposed Soko Islands Marine Park and the surrounding waters. · Population biology of the Amphioxus, (about which, while found throughout Hong Kong waters, little is known but is noted as a protected species in China). It is intended that surveys would be conducted before and after construction and during the operation phase of the LNG terminal as agreed with the SEAC. 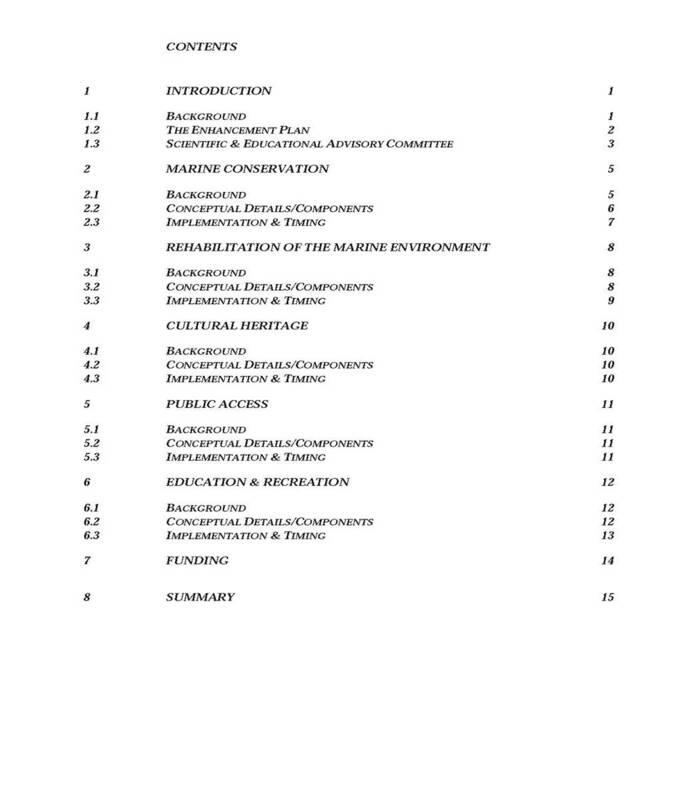 · Surveys of the benthic fauna within and outside of the proposed marine parks pre-designation and then during operation of the LNG terminal and marine park. · Long term water quality monitoring at suitable locations in the Soko Islands Marine Park to verify the predicted environmental performance of the terminal. · Monitoring of different coastal shore habitats including sandy, boulder and high energy shores within the proposed Soko Islands Marine Park. Surveys will follow accepted protocols and specific defined time periods for pre, during and post construction phases of the project. The aforementioned behavioural and biological studies would form part of CAPCO’s scientific support for the marine parks programme. It is envisaged that, where possible, CAPCO will engage local academics and universities to either lead, assist or support these studies. CAPCO has a long history of funding conservation projects and studies within local academia and considers this a clear opportunity to continue this tradition as part of the Enhancement Plan. The findings of these studies would be presented to the SEAC, who would have the ability and means to action key recommendations into possible future management and monitoring programmes. The works highlighted above would be conducted according to the phases of the Project, ie elements would be conducted during the pre-construction work (eg population biology studies of Amphioxus) and others would continue during the construction and operation phases for a limited time. It is expected that some of the studies (e.g. pre-,during and post-construction marine mammal surveys) would provide useful data that will contribute to the management of the marine conservation areas. In conducting the preliminary investigations of South Soko Island it was revealed that an area of the seabed to the west of North Soko was formerly used as a sand dredging and marine borrow area. The area has naturally sedimented to a degree but remains depressed from the surrounding seabed. It is noted that similar habitats at East Tung Lung Chau in the eastern waters of Hong Kong have been observed to have become areas where commercial fish aggregate. Such occurrences have been hypothesised as allowing a level of protection to fish due to the variable seabed resulting in difficulty in efficient trawling practices. AFCD had examined the site in the past as a potential location for deployment of Artificial Reefs. Whilst it is noted that the site experiences high sediment loads at certain times of the year, it is also noted that Artificial Reefs could provide a mechanism to rehabilitate this former sand dredging area. Other options would be examined for rehabilitation, including expansion of the boundaries of the Marine Park to include the sand dredging and marine borrow area. Marine geophysical surveys undertaken as part of the EIA revealed that the seabed in the vicinity of the Soko Islands exhibits the marks of demersal trawling and anchor scours. These marks indicate that the seabed has been, and continues to be, subject to disturbance which will affect the diversity and abundance of benthic organisms. It is noted that there exists an opportunity, through designation of Marine Park status to legislate against these disturbances, and though the physical presence of the LNG terminal to facilitate enforcing the desired controls. · Assistance to Government in the implementation and enforcement of fisheries protection areas. · Assistance to Government in the implementation and enforcement of vessel speed restrictions and no anchoring areas. · Complement the Country and Marine Parks Authority in their management of the Soko Marine Park through provision of regular litter collection services for the land and coastal areas of South Soko Island. It is expected that the above components of the Enhancement Plan would be part of research initiatives. As discussed above specialists in relevant fields would perform the above investigations in consultation with the SEAC. For example, controls on fishing activities will need to be discussed with fisheries representatives on the SEAC. The EIA report indicated that the South Soko Island has interesting heritage and historical features. These include temples, graves, earth shrines and an archaeological site () . The heritage assessment presented in the EIA indicates that a Rescue Excavation of archaeological artefacts will be required in specific locations within the terminal layout. It is noted in the EIA that the archaeological deposits on the island have been disturbed in the past and many are subject to erosion at present. The siting of the LNG terminal at South Soko will facilitate the rescue of these deposits to ensure their preservation by record and display for future generations. The rescue excavation activities will not form part of the Enhancement Plan as they will conducted as a mitigation measure and will be actioned according to approvals issued by the Antiquities and Monuments Office (AMO). CAPCO is committed to provide assistance to AMO for placing these artefacts on public display at a suitable location. Further investigations will be conducted to determine whether elements of the findings from the rescue excavation can be displayed on South Soko. Opportunity to prepare educational displays on the island will also be subject to security and logistical considerations. The rescue excavation works will be conducted by licensed archaeologists commissioned by CAPCO under the supervision and audit of AMO prior to construction works on the site. The artefacts will be stored by AMO and CAPCO will work with AMO on arranging and funding the display. At present access to South Soko Island is via the pier constructed as part of the detention centre works or via a small and dilapidated wooden jetty close to the Tin Hau temple. Access to the Island will be reprovisioned in an area away from the terminal. · a source of potable water to South Soko. The replacement pier will be constructed during the period when the LNG terminal is under construction and will be completed by the time the terminal is operational. CAPCO will fund the design and construction of the pier. As discussed in Sections 2 and 4 above the South Soko Island has conservation and heritage features that can be enhanced to facilitate recreational use and to maximise educational opportunities. This component of the plan would focus on education and recreational aspects. 8. benefits of clean energy for Hong Kong. · bird and butterfily watching areas at suitable locations near the abandoned freshwater reservoir. Construction of the afore mentioned features can be accommodated during the LNG terminal construction period. CAPCO will fund the design and construction of these facilities in consultation with the SEAC. At this early stage in the development of the Enhancement Plan and its initiatives, it is premature to discuss exact funding arrangements. However, to develop an understanding of the scope and scale of CAPCO's proposal, some quantification may be helpful. CAPCO’s estimates for the cost of the Enhancement Plan as herein described is approximately HK$100 million with over half of that sum allocated to marine enhancement programmes. · CAPCO has undertaken studies over the last four years to investigate the potential establishment of a LNG receiving terminal in Hong Kong. · The various studies have included three years of comprehensive stakeholder engagement. · Based on local and international experience CAPCO has identified and adopted stringent measures to address concerns related to the coexistence of a LNG terminal with a marine park during both the construction and operation phases. · Working with the HKSARG CAPCO is fully committed enhancing the environment of South Soko and surrounding waters including regular consultation with a Scientific Education and Advisory Committee. · CAPCO’s commitment to the enhancement of the Soko Islands has been evidenced in the concepts presented in the Enhancement Plan which cover various phases of the project, encompassing pre-construction, construction and operational phases. · The concepts presented in the Enhancement Plan would only be fully realised through the siting of the LNG terminal at South Soko Island. () ERM - Hong Kong, Limited (1998) Fisheries Resources and Fishing Operations in Hong Kong. For the Agriculture, Fisheries and Conservation Department, Hong Kong SAR Government. (6) Houde, ED (1987) Fish Early Life Dynamics and Recruitment Variability. P. 17-29. In Hoyt, RD (ed). Proceedings of the 10th Annual Larval Fish Conference held in Miami, FL May 18-23, 1986. American Fisheries Society Symposium 2. American Fisheries Society, Bethesda. MD. (7) Govoni, JJ (2004) The Development of Form and Function in Fishes, and the Question of Larval Adaptation. American Fisheries Society, Bethesda, MD. (8) Langford, TE (1983) Electricity Generation and the Ecology of Natural Waters. Liverpool University Press, Liverpool. 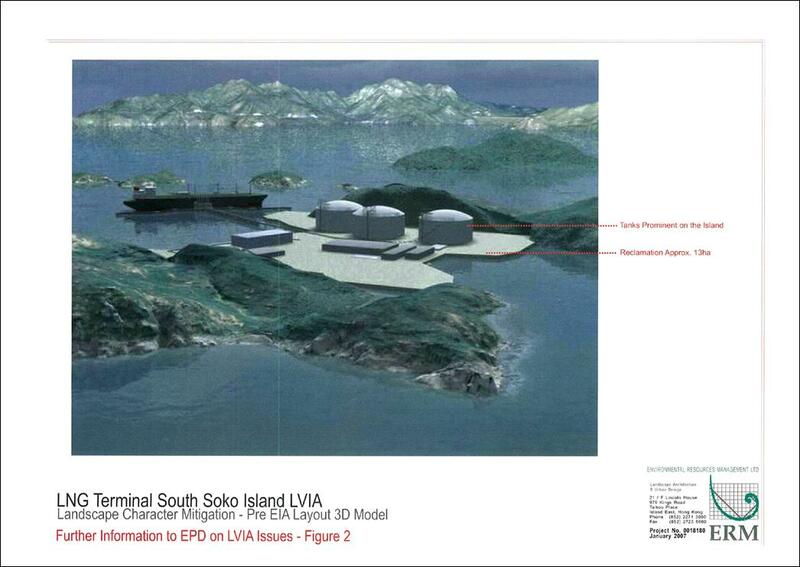 () ERM - Hong Kong, Ltd (1999) EIA for a 1,800MW Gas-fired Power Station at Lamma Extension. Final EIA Report. For The Hongkong Electric Co., Ltd.
() Langford TE. 1983. Electricity generation and the ecology of natural waters. Liverpool University Press. () Technical Memorandum Standards for Effluents Discharged from Drainage an Sewerage Systems, Inland and Coastal Waters, Water Pollution Control Ordinance, Cap 358. () Redrawn after Mattice and Zittel. 1976. Site Specific Evaluation of Power Plant Chlorination. Journal of Water Pollution Control, 48:(10) 2284-2308. () Mattice JS & Zittel HE. 1976. Site specific evaluation of power plant chlorination. Journal of Water Pollution Control. 48 (10): 2284 - 2308. () Morgan RP & Prince RD (1977) Chlorine Toxicity to eggs and larvae of five Chesapeake Bay fishes. Transaction of the American Fisheries Society. 106 (4): 380 - 385. () Grieve JA et al (1978) A program to introduce site-specific chlorination regimes at Ontario hydro generating stations. Pages 77-84 in Jolley RL et al (1978) Water Chlorination. Environmental Impacts and Health Effects, Volume 2. Michigan: Ann Arbour Science. () Technical Memorandum Standards for Effluents Discharged from Drainage and Sewerage Systems, Inland and Coastal Waters, Water Pollution Control Ordinance, Cap 358. () Mattice JS & Zittel HE (1976) Site specific evaluation of power plant chlorination. Journal of Water Pollution Control. 48 (10): 2284 - 2308. () Fernando Martinez-Andrade and Donald M. Baltz (2003). Coastal Marine Institute: Marine and Coastal Fishes subject to Impingement by Cooling-Water Intake Systems in the Northern Gulf of Mexico - An Annotated Bibliography. U.S. Department of the Interior. () Turnpenny, A. W. H (1988) Fish impingement at estuarine power stations and its significance to commercial fishing. Journal of Fish Biology, Vol. 33, pp. 103-110. Members are referred to the below web sites for the Dominion Cove Point LNG Terminal & the Cove Point Natural Heritage Trust to learn more about this facility and the innovative approach development for responsibly managing environmental issues. () The issue of the effectiveness of preventing destructive fishing practices in remote areas has been raised recently in the South China Morning Post dated 30-01-2007. () It should be noted that some of these items have been reported in Environmental Monitoring & Audit Manual. They are, however, specific components of the Enhancement Plan and not activities that form part of the EM&A process. () Removal and relocation of graves, temples and shrines will be conducted in consultation with the users/relatives.